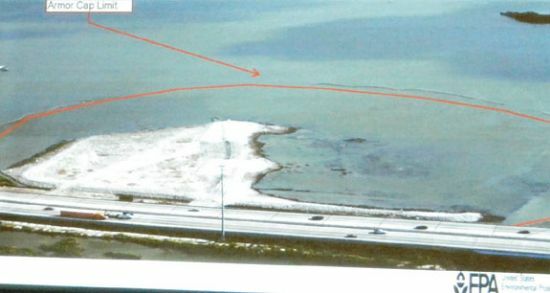 HARRIS COUNTY, TX  Harris County Attorney Vince Ryan is reminding fishermen that they should not catch, eat or distribute seafood from the San Jacinto River Waste Pits Area covered by Texas State Department of Health advisories. The upcoming holiday weekend attracts more recreational fishing over the long weekend, even as Harris County continues its efforts to address the public health threat to residents by warning them against consuming seafood from the vicinity of the San Jacinto Site. Because of the health risks caused by the dioxin, the Texas Department of Health has issued a consumption advisory for crab and all species of fish from the San Jacinto River and warned women who are nursing, pregnant or who might be pregnant and children under the age of 12 not to consume any fish or blue crab from the area. The Health Department also advised adults and children to avoid the risk of exposure to dioxin through skin by not camping, fishing, swimming or picnicking near the San Jacinto River where the toxic waste ponds were located. According to the County, the health of both humans and the local ecology are threatened by releases of dioxin from the waste pond sites. Advisory signs have been posted but Ryan worries that people are still fishing in dangerous waters. Ryan also points out that lower water levels due to lack of rain in Harris County are making dioxin more concentrated in the river. What are called Chlorinated Dibenzo-p-dioxins or CDDs may be formed during the chlorine bleaching process at pulp and paper mills, especially the most toxic form2,3,7,8- TCDD. According to the Centers for Disease Control, most dioxins attach to soil and settle to the bottom sediment in water, where they build up in the food chain. Eating food contaminated with dioxin accounts for 90% of the intake of CDDs in humans. World Health Organization have determined that 2,3,7,8-TCDD is a human carcinogen.Ryan filed a lawsuit in December 2011 against Defendants International Paper Company, Waste Management, Inc., Waste Management of Texas, Inc. and McGinnes Industrial Maintenance Corporation (MIMC) for allowing these toxins into the San Jacinto River. An amended suit filed August 15, 2012, sheds new light on the causes of the public health threat emanating from the Site and identifies new evidence detailing the Defendants actions, inactions and silence that have led to decades of dioxin exposure to the public and at every level of the food chain. As Ryans Office has discovered, the presence of dioxin in the San Jacinto River and community was no accident. Documents have revealed that the abandonment of the deteriorating and leaking dioxin waste pits was actually planned, purposeful and intentional. Disturbingly, internal documents of Defendants MIMC and Waste Management of Texas show that the company in control of the San Jacinto Waste Pits intentionally voted to abandon their pits full of dioxin waste, while company executives voted at the same time to reward themselves with huge bonuses. The people of Harris County do not think it is acceptable for the companies responsible for the dioxin to reward themselves financially for their misdeeds, devise and execute a plan to wash their hands of their pollution, and allow it to wash instead into Harris Countys waterways to become the responsibility of the taxpayers and a danger to the community, Ryan said. The Countys suit seeks monetary penalties against Defendants under state civil law statutes to reimburse the County for the taxpayer dollars spent addressing Defendants toxic wastes  including the dioxin known as 2,3,7,8-TCDD  a type of dioxin widely regarded as the most toxic chemical ever made by man. Penalties recovered will be shared with the TCEQ, with portions being earmarked to provide resources for the citizens of Harris County to learn about and respond to the dioxin in their river, among other programs. Harris County is represented by Vince Ryan, Harris County Attorney, Terry ORourke, and Rock Owens of the Office of the Harris County Attorney, and the law firm of Connelly · Baker · Wotring LLP. CROSBY, HUFFMAN  School board elections will be held in both local districts in northeast Harris County this year. There is one contested position in Huffman where four positions come up for popular review and there are three contested school board positions in Crosby where three positions are subject to elections. In Huffman only Guy Smith will face contender Patrick Keith for the seventh position in the At-Large District. Dean Tinnin, Charles Bardwell, and Matt Dutton are unchallenged. Position 5 is a challenge between incumbent Carla Mills Windfont and Will Locke. Position 7 is between incumbent Gerald L. Blankenship and Dr. James Hofmann. Asking each candidate what would they like to see happen if they are elected to their prospective position this time gave unique answers. David Shaver is interested in more quality technical training for students that do not wish to attend college. Gerald Blankenship said that he wants to continue on the school board because, I think our school board is facing a very critical time, we are going to be looking at a building program sooner than we want to and I feel that my experience can help this process go smoother and I can be a good steward of the taxpayers money and I always look at ways to save money for the district. Dr. James Hofmann answered, The main thing that has been driving me to run over the last few months is the moral of this district, the moral of the teachers I feel is at an all time low. I feel students moral is way down. It is hard to pinpoint the exact reason but I feel that our good teachers are not being allowed to do what they do. You always have teachers that dont want to teach and they should not be there but they are the ones that are not effected. “I think you know that the district here has been financially strapped but we have been able to put out pretty decent students. Ive been in this district since 1995 and I know a few teachers make a whole lot of difference in your life and I know Crosby has those but I feel they are real disenchanted right now with the way things are going. I hope to make some change. You have seen the change we lost our school teacher of the year last year, Marty Murray, we lost obviously our football coach, who was held in high esteem. 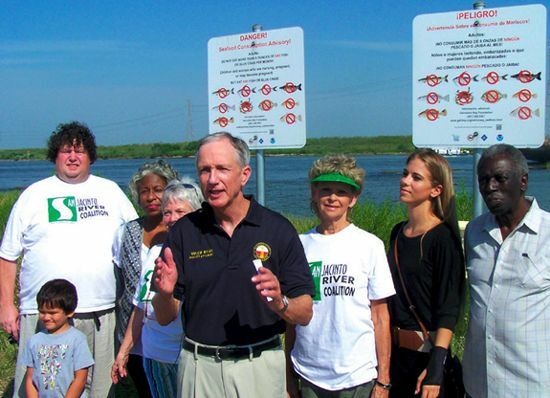 August 16, 2012Harris County Attorney Vince Ryan announced today that his Office has filed an amended complaint against several companies that knowingly allowed dioxin to pollute the San Jacinto River for over 40 years. The complaint details the companies actions, inactions, and silence that led to decades of dioxin exposure to the public and the food supply of Harris County. The lawsuit was first filed in December 2011 against International Paper Company, Waste Management, Inc., Waste Management of Texas, Inc. and McGinnes Industrial Maintenance Corporation. The Countys lawsuit contends that in 1965 the Champion Paper Mill contracted with what is now a Waste Management company to dispose of toxic wastes from a paper mill into ponds located near the San Jacinto River. The waste ponds were eventually abandoned and portions of the ponds and their toxic contents became submerged below the San Jacinto River. The chemical wastes include dioxin which is widely regarded as one of the worlds most toxic chemicals. According to the lawsuit, historical documents reveal that the abandonment of deteriorating and leaking dioxin waste pits was planned, purposeful and intentional. The Countys lawsuit alleges details of a corporate plan to dispose of toxic black liquor into ponds near the shores of the San Jacinto River. Defendants are alleged to have voted to abandon pits full of dioxin waste, while company executives rewarded themselves with large bonuses. The complaint notes that [b]ecause Defendants have left a legacy of pollution in Harris County by causing and allowing dioxin to be released into the San Jacinto River instead of spending the money to properly dispose of their dangerous chemicals, it is appropriate that they now compensate Harris County for the consequences of their choices. Harris County is represented by Vince Ryan, Harris County Attorney, Terry ORourke, and Rock Owens of the Office of the Harris County Attorney, and the law firm of Connelly – Baker – Wotring LLP. HUFFMANTwo men died in a head-on crash in Huffman last Thursday (August 9) morning. The accident happened in the 28000 block of FM 2100 near Jackpine around 6:00 a.m., Sheriffs deputies said. Officials said a Dodge pickup was traveling northbound on FM 2100 and crossed the center line, slamming a white Toyota Tundra traveling southbound. 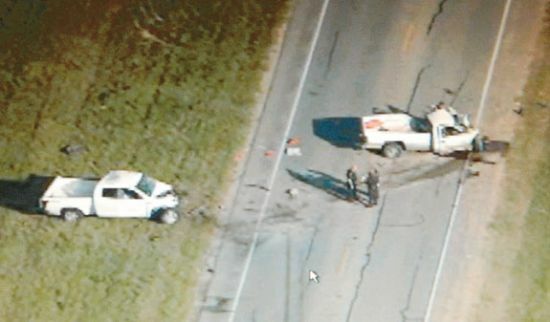 Shawn Emery, driver of the Dodge, and Charles Strnadel IV, driver of the Toyota, died at the scene, officials said. A baby-girl, daughter of Strnadel, was in his dads truck and was airlifted to Memorial Herman Hospital in stable condition and is expected to survive. Strnadel was taking his daughter to a day care, authorities said. The accident is under investigation, speed may have been the factor, but authorities are also testing for any alcohol or drugs. CROSBY  Phases of construction for the overpass here are coming that will make changes in traffic flow, eventually leading late next Summer to a four lane overpass with frontage roads on both sides and access in both North and South for intersecting roads. Ultimately, an overpass will stand at the railroad tracks with square columns with an arch at the top, with reveals and striations like a limestone surface. The facade at the middle will look much like the design commonly associated with the Alamo. In spite of numerous utility issues, finding three undocumented gasoline tanks, and a wet month of June  NBG Constructors, Inc. is hoping to move ahead with switching northbound traffic to the new East side frontage road of FM 2100 later this month. Plans indicate that this switch, called Phase 2 of Step 1, is to begin the weekend of August 25. That plan is based on being able to complete the change of the intersection of Wahl St., (where the traffic light is at Crosby ACE Hardware) and put in some paving on Riedland Ave., plus sidewalks and driveways. That seems a lot to get done in the next couple of weeks and it could lapse over into the following weekend, according to David Boehm. Boehm is over the entire project for N.B.G Contractors, Inc. General/Highway Contractor and works with the Texas Department of Transportation (TXDoT) to fulfill the design specifications for an overpass of the railroad tracks across FM 2100 between Kernohan St. and Jackson Bayou. 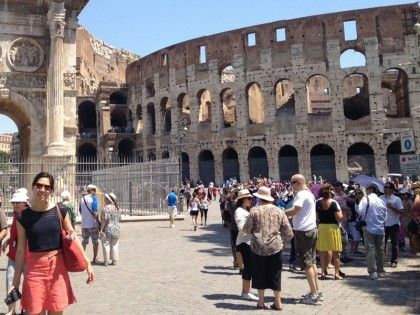 One factor that came as a dull surprise was that the completion of the project may be in August or September of next year depending on the number of surprises the construction encounters during the process. We have found all of the utilities on the East side, I can tell you that for a fact. Boehm joked in reference to surprises encountered with utilities including the natural gas lines being next to power poles, three unexpected gasoline tanks and other utilities not being where they were expected to be. Power pole had to be braced last weekend for work to continue on the storm sewer that runs the length of the project all the way to South Diamondhead. Sometime in September of this year, the roadway will consist of two lanes North on the East sides new frontage roads and one lane South, all new roadway on the East side. After that time, the extant FM 2100 will be torn up, the company will then start laying all the sewer leads and new water leads that will ultimately replace a two inch water line with a new 8 inch plastic water line. Boehm answered that for much of the construction period that the traffic configuration will be from Wahl St. South will be one lane North and one lane South. From Wahl St. North there will be two lanes North and one lane South. The project is being built on TXDoT specifications and there is to be 5 foot wide sidewalks running the length of the project. Once the leads have been established, a huge new box culvert will join one already in place on the East side (since January) and work on the West side will begin making the center and southbound frontage road. The 1/2 of that big culvert that crosses FM 2100 between Kernohan St. and Wahl St. is one of the major complications to the project. It will begin late September to October. Once these phases have been accomplished, there will be a time in which the constructors will have to switch the water and sewer systems to the new lines and each individual household will be asked to cooperate for a few hours as the switch is put in place. Residents will be notified in writing and other methods of the approach of this time. Construction of two sides of the new frontage road is going to be completed near late Spring or early Summer of next year. When that feat is accomplished there will be for some time two lanes running North and South but those lanes will be periodically interrupted for construction of pillars and walls for the overpass as the project nears completion. One can see the beginning of the overpass constructed now in one wall going up. The overpass itself is to run from Wahl Street up over the tracks to its height and then comeback down on the North side at about equal distance from the track in both directions. The increasingly frequent trains running through Crosby will cease to stop all traffic at that time. Moving through the center of FM 2100 will be much easier. Precinct 2 will be re-building South Diamondhead Boulevard also. Incidentally, the completion of the expansion of the Panama Canal Project is thought to be finished in 2014, many wonder if that could mean even more goods and services coming to the Houston Ship Channel via trains, increasing the frequency through our area? CROSBY  The new budget for the 2012 -2013 school year passed August 13 and the Superintendent is glad the emphasis is more on instructing students. The school board also decided to continue with CRE8 Architects from eleven bidders to handle projects for the district. The word is that this firm has been very responsive to the needs of the district. This is our 4th year of a $0.17 per $100 valuation tax increase in Crosby. There is a 1% salary increase for employees this year and yet a number of teachers have left for retirement and some for higher wages. About 310 teachers work in Crosby ISD, depending on how you define teachers. Eighty three new educators for Crosby ISD will be welcomed at Thursdays New Educators Luncheon by the Crosby-Huffman Chamber of Commerce. Thirteen and a half new teacher units will be added this year. In addition to the new high school principal, a new Mr. Walter Barringer will principal at Drew Elementary School. Ms. Warpole is New Assistant Principal at Barrett Primary, she has been promoted from teacher. Karla McGee is the new Director of Special Education. The local school tax makes up 40.57% of the budget to total $15,204,100. The State & Federal governments pay $22,267,670 for a total budget to maintain and operate schools of $37,471,770. The district pays people, all of them, to work for the school $28,864,235, 77.03% of the budget and 22.09% to operate or $8,276,165. Crosby ISD is hiring 13.5 new teachers to provide class size reduction and enhance instruction. The Crosby ISD fund balance is $331,370 or 0.88% of the budget. Overall comparing to other nearby districts this is a very efficient budget per student. The aggregate budget for the year 2010-2011 was $22,145,390 or $4,682 per student but in 2011-2012 fell to $21,101,609 or $4,379 per student. Next year the instructional aggregate budget is $21,976,220 at $4,604 per student. A higher percent is to be spent teaching than new transports, shifting around, supplies, services, and fixing situations. Season tickets for Barbers Hills six varsity home games of the 2012 football season will be offered for sale beginning August 13. The first two weeks of ticket sales are reserved for current season ticket holders who wish to purchase the same seats for the upcoming season at $42 per seat for the season. Tickets will be available to current ticket holders August 13 – 16 and August 20 – 22, from 8 a.m. – 12 p.m. and 1 – 4 p.m. at the BHISD tax office at 9600 Eagle Drive, Mont Belvieu. Extended hours for ticket sales will be offered August 23 from 7 a.m. – 5 p.m.
Tickets must be purchased during these times in order to reserve the same seats purchased last year. Reserved season tickets for first-time buyers will be available beginning Monday, August 27, at 8:00 a.m. at the BHISD tax office. No reserved tickets will be sold at the gate. General admission pre-sale tickets will be sold for each home and away game. Ticket sales will start on Wednesday and end at noon on Friday of each week. Adult tickets are $5 and student tickets are $3 and will be sold at the High School, Middle School, Intermediate School, and BHISD Tax Office. All tickets purchased at the gate by adults or students will be general admission at a cost of $6 each. Guests are invited to come early before home games to enjoy dinners provided by district student organizations. All events except the Tailgate Party will be held inside the Middle School cafeteria and tickets may be purchased at the door. The Tailgate Party will be held behind the Central Administration Building. For more information, visit bhisd.net or call the tax office at 281.576.2221 x 1205. CROSBY  The stunning loss of Cody Paul Stephens last early May left this community stunned, the 6 foot 9 inch football player was an inspiration to his classmates and Church members. Now Crosby High School and Tarlton State University are in the process of honoring is memory. His father, Scott Stephens, is undergoing the process of establishing a 501C3 charity to bestow scholarships for Crosby High School students. A memorial scholarship fund has been established at Community Bank of Texas N.A. Early in the football season, the Crosby Cougars will pay a preliminary recognition to Cody and later once all the graphics have been established sometime during the season at a home game the new digital scoreboard will share a special tribute to Cody Stephens, according to Dr. Keith Moore, Superintendent of Crosby ISD. The press box at Cougar stadium will be painted with the slogan, “Go Big or Go Home.” both in honor of Stephens and in the way of a team brand. Tarlton State Universitys football team won the community service award on campus last year, in honor of scholarship recipient that was unable to attend will rename that award, “Go Big or Go Home” in reference to Codys motto and that will be announced on September 8. Anyone wishing to attend that ceremony should contact Scott Stephens. Dr. Moore stated that within the next two weeks the repainting of the press box should be accomplished. He also stated that throughout the district the new Crosby Cougar should be uniform as the a brand for the school district. The old and their are about six different Cougars but the one most often used looks entirely too much like Penn State University and the N.C.A.A. had said the district was not to use that one anymore. He also stated that the scoreboard will not be ready until October. He indicated that the big tribute to Cody will wait until the scoreboard is operational and will probably be mid-season. PASADENA  Precinct 2 Commissioner Jack Morman announced that he was commencing an initiative called BetterStreets2Neighborhoods in the Nelson Subdivision already with a major effort to begin on August 27 and plans to rebuild South Diamondhead in Newport Subdivision beginning March of 2013. This new road rebuilding effort is an attempt to fix roads decimated by last years drought and/or some that have not been refitted with asphalt in the last 20 years or so. 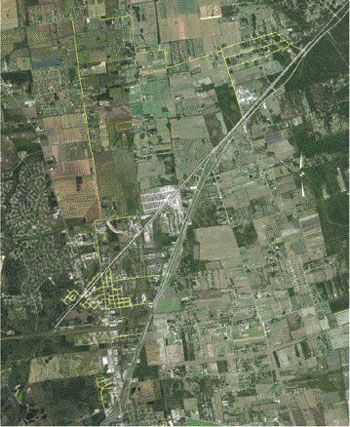 Obviously, these county road fixing efforts will run concurrent with the construction of the overpass of FM 2100 at the railroad tracks, that is to conclude in late Summer of 2013. Much speculation has been offered as to why the resurfacing and subsurface rebuilding efforts had to be concurrent with the overpass construction. “We want to protect the taxpayers investment in our infrastructure by maintaining what we have before we lose it. I am dedicated to providing improved street maintenance service throughout Precinct 2. You might see our contractors in your neighborhood. 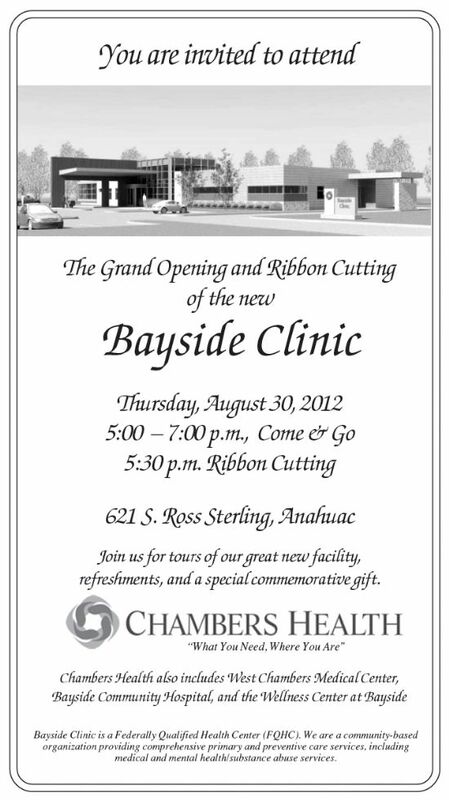 We anticipate only being there 45-60 days. The Old Crosby or Nelson Subdivision was to have begun in July and some has begun but the major work will begin on August 27. The cost of that resurfacing is to run $2 M.
The rebuilding of South Diamondhead in Newport is to begin March of 2013 and in itself is to cost $2 M. Residents should begin to think of how to avoid construction with South Diamondhead and FM 2100 as the overpass will be nearing completion in the Summer of next year. There are two other exits from Newport.